Please arrive 15 minutes early to allow time for set up. Tea/coffee and snacks will be complimentary but please bring your own lunch. (optionally your own coffee cup). Registration: Please send an email to OAGworkshops@bell.net and then secure your spot by sending a cheque payable to the Orangeville Art Group to: 57 John Street, Orangeville, ON L9W 2P6. Please mention which workshop you are registering for. OR, you can pay using PayPal as directed on the web site below. Spend a day using just the three basic colours, a red, a yellow and a blue. See what you can produce using just these three colours, and some white. You can paint landscapes that look very traditional but it is much more fun and exciting to let your imagination run wild and be creative. You will be surprised at what you can produce. 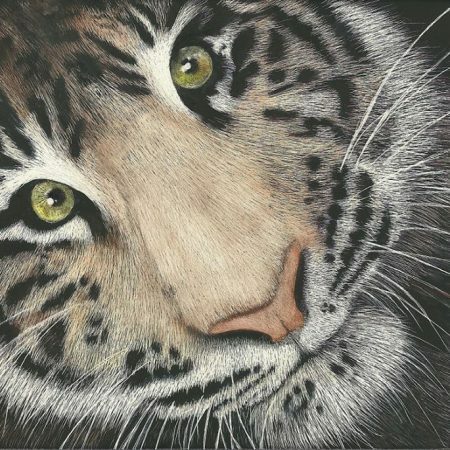 Warren will bring finished paintings to illustrate the wide variety of images that you can produce. You will have difficulty believing that each of the paintings was done with the same three colours. Warren paints with oils; the paintings you will see have been painted using naphthol red, cadmium yellow and ultramarine blue, plus titanium white. Nothing else. Other combinations of red, yellow and blue also work. 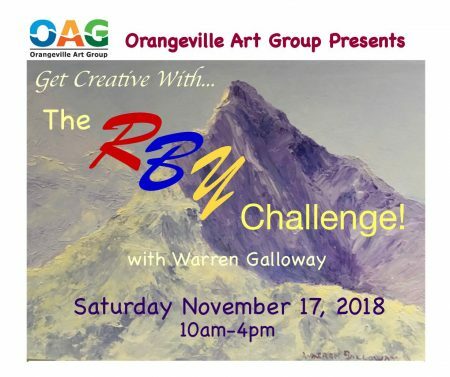 Participants may bring the painting medium of their choice. This will be a day when you do the painting, have fun and be creative. Warren is retired and is a resident of Orangeville. He has been on the Board of OAG for over 9 years, mostly organizing workshops and more recently as Secretary. 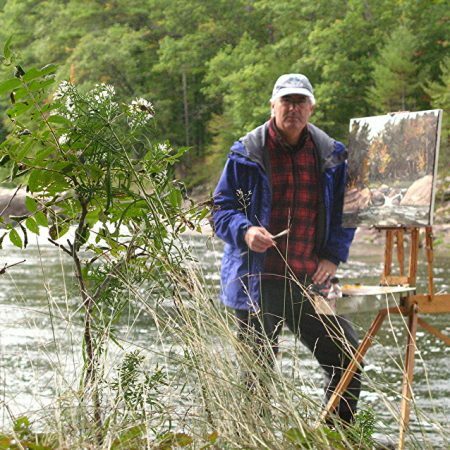 He started his artistic ventures as a photographer of landscapes and nature, doing multi-projector slide shows and has been painting for 17 years. He paints using a palette knife and a rag; his brushes have been retired for many years. You are welcome to bring palette knives and try them. Bring your usual materials for painting but limit your colours to one red, one yellow and one blue (and white); no other colours that might be a temptation to you and which could ruin the colour harmony. Bring photo(s). Photos should be black and white, not colour, to help your creativity. Warren will bring photos. He will also bring rags/gloves and rough-ins to show how he starts a painting. Bring at least one canvas, suggest 16×20 and/or two smaller ones; you will spend almost the entire day painting. Remember a cover sheet for the table.